You might be tempted to skip over a high school graduation party. After all, it's a busy time of year and it may be hard to get people together. But, graduating from high school is an important milestone that really marks the end of childhood. 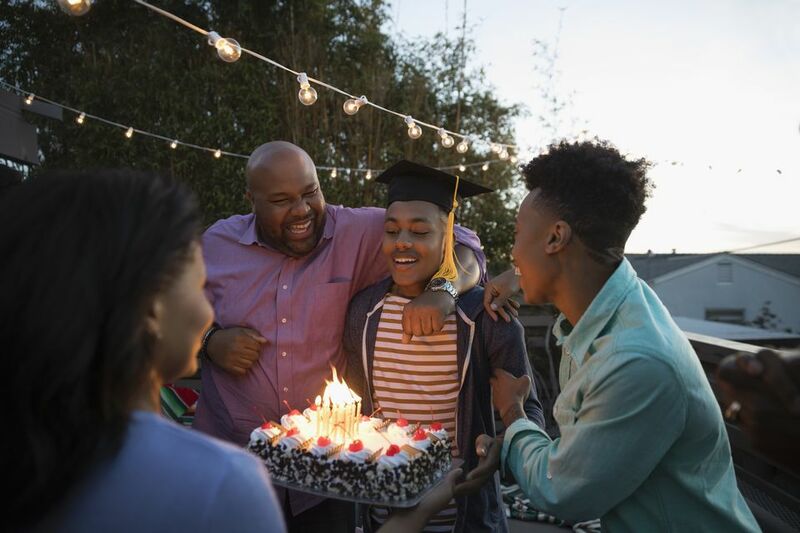 Throwing your teen a graduation party could help him honor the fact that he's about to enter the adult world. Whether he's planning to get a job, head off to college, or join the armed forces, don't underestimate how a party could help him transition from one phase of his life to the next. Whether it's a small get-together or a large bash, high school graduation party requires a fair amount of planning. The more time you invest planning the party, however, the less time you'll need to spend worrying about all those last-minute details. Are you planning a large graduation party or a small dinner? Graduation parties can range from informal backyard barbecues to smaller gatherings with immediate family. Think about what type of party will suit your teen best. Get your teen involved too. After all, it's his big day. Ask what type of a party he'd enjoy the most and make the party about him. This can be harder than you think since Mother's Day and Memorial Day occur around the same time as most high school graduations. Your teen's friends will also likely be throwing parties of their own so you'll need to consider whether your teen wants your friends to attend as well. If you are going to use a hall, park or restaurant, you’ll need to begin planning this while you're picking a date. If you are going to use your home, jot down things you might want to rent, such as a tent. Create a reasonable party budget. Write down everything you're going to want to purchase and add up the cost. The cost of food, party favors, invitations, and decorations can add up fast if you're not careful. While the overall theme will be the graduation, you’ll need more than that to pull your party together. A theme for a graduation party can be as simple as the school colors or as detailed as the graduate's college major. Choosing a theme will help you purchase supplies and decide on menus. Will you be having a caterer make the food or will you be doing it yourself? Either way, you’ll need to decide if you are serving a meal or just finger foods. Don't forget the cake! Don't feel like you have to do everything. If your teen has a lot of demands or requests, make sure she helps you with the planning and preparation. Get other friends and family to help out as well so you don't have to do anything. You'll want to make sure you have an opportunity to enjoy your teen's party. Create a guest book that will allow guests to write a message to your teen. Words of wisdom, heartfelt advice, and words of encouragement can go a long way to helping your teen feel confident in the future. Make a time capsule. Have each person bring something that has to do with their years in high school. Place this in a box and give it to someone for safekeeping until their 10-year reunion. Sometimes, a few games can make the party a lot more fun. Play pin the mustache on the teacher. Blow up a picture from the yearbook of one of the teachers, your teen will give you an idea of which one. Make mustaches out of cut-out black construction paper. Place tape on the back of each mustache. Then the game proceeds just like pin the tail on the donkey. Place the name of a teacher on a sticky label. When a guest comes in, stick it on their back. They have to ask other guests yes-or-no questions about the teacher and guess who it is by the end of the night. What Are Good High School Graduation Party Ideas?